I thought I would do a little review on a product I recieved in this month's Birchbox which was two samples of the Cattier Pink Clay mask. I must admit I don't often use a lot of face masks and if I do it's always the Simple clay mask, but I'm always excited to recieve products like this in my box because it is perfect for a pamper session. Cattier isn't actually a brand I've heard before but when I was doing a bit of research about them I found out that they do a variety of different clay masks. It turns out the pink clay mask is for sensitive skin which is why it includes Aloe Vera in it, but they also have a yellow clay mask for dry skin with Jojoba Oil and white clay for allskin types. I was really happy to see that I recieved the one for sensitive skin, it doesn't take much to upset my skin. I must admit, I kinda love the fact it's pink but as samples go, this is quite a good size and you do get a lot of product in it. If I wanted to be a little tight I could definitely squeeze two uses out of one sachet. It smelled great, it had a lovely aloe vera scent with menthol/minty undertones, in fact it reminded me of a Murray Mint which I know is an odd thing to say but it really did. Very pleasant. It's a lovely thick consistency and I used a whole sachet on my face and neck, I was not stingy at all. 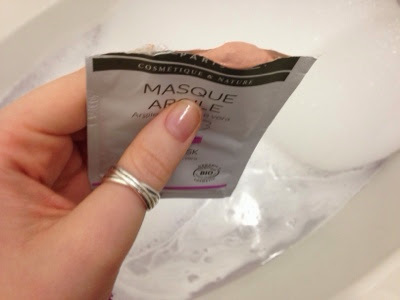 However what I did find was that the areas which had less product dried very quickly which I hate in a face mask it always feels really weird and it tends to leave my face feeling a little dry after I wash it off. After 10 mintues, I removed the mask with my Liz Earle muslin cloth which wasn't the greatest idea, as it definitely turned the thing a lovely pinky/orange colour but to be fair it will probably wash out of the cloth. I'm actually really happy with the Cattier Pink Clay mask, I found my skin was very soft afterwards and it seemed to draw out some imperfections/spots so that the next day my skin was looking fresh. My skin is actually pretty bad at the moment which I put down to stress but I feel like this product really helped. I'd even go as far to say I would consider buying the full sized Cattier tube. Have you tried the Pink Clay mask or anything from Cattier?